KINETIC CARNIVAL: Charles Denson’s new book Is A “Wild Ride!” Through Coney’s Heyday! 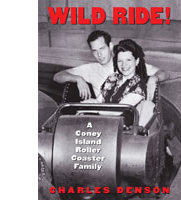 Charles Denson’s new book Is A “Wild Ride!” Through Coney’s Heyday! "Without warning, an ear-splitting siren revved up, blasting the riders. Bright red strobes surrounded by a cone of mirrors began pulsing and then rotating, creating an illusion that the entire barrel was spinning out of control and that the train and its riders had turned upside down." Unpredictable circumstances is what you’d find yourself in when snuggled up in one of the trackless toboggan cars of the popular Bobsled ride at the tail end of Coney Island’s heydays. An art deco-style, all-wood coaster was one of the last “flying turns” rides brought over from the 1939-40 New York’s World Fair to begin a new life in the Coney Island of the 40’s. It replaced the historic Stauch’s Restaurant which replaced part of the old Bowery. Coney Island has always thrived through its constant metamorphosis but for the first time since the beginning of its glory days in the late 1800’s, it was about the get its worst beating. The bobsled was one of the last remaining vestiges in the 70’s before Coney would go into a near-death comatose that would last for almost thirty years. What kept amusement riders of that tail-end period - like the Bobsled, the Tornado, and L.A. Thompson’s Scenic Railway - thrilled for many years was only possible through the passion and dedication of the novel artisans and dreamers behind them, as they toiled through long hours each day to create and run the mechanics of the fascination business. One of these men was John Bonsignore, who grew up surrounded by the amusement industry of Coney and who would later give up his other aspirations to join in allegiance with his empowering and ambitious father. Both men and their families would prosper in the world of amusements and mark their place, forever, in the history of Coney Island. In the midst of Coney’s changing face amid the fires and the rebirths, Charles Denson, allows us to relive the same passion that evoked the memories of John’s childhood while growing up in the ‘back lot’ of the amusements. On W. 8th Street sat the Bonsignore house encircled by the last turn of the L.A. Thompson roller coaster that was acquired by his father. Living on W. 8th Street, right next door to Luna Park, was more than just a unique neighborhood for John – it was a unique way of life. 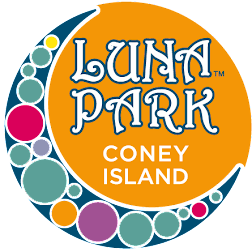 In the hub of Coney’s amusement manufacturing industry John spent his years inspired by the talented imagineers of that time who toiled away in their shops producing the rides, arcades, and all other mechanical contraptions for the amusement district for Coney and around the world. And John Bonsignore was in the middle of it all. The Bonsignore house which was previously built by LaMarcus Thompson – the pioneer who built Coney’s first coaster; the Gravity Pleasure Switchback Railway – was originally built as a shop for the Thompson Scenic Railway coaster. By the time John got married and the family began to grow, the brick coaster home, which would rumble all summer long whenever the coaster cars roared by, began to get crowded. The house was also a workshop and John's wife, Louise thought the house was strange in more ways than one. "The coaster tracks ran through the attic and connected to an elevator that lowered cars through the house to the basement shop for repairs. Scenery from the old Oriental Scenic Railway was stored upstairs, and the tin roof turned the attic into an oven like space that Louise used for drying diapers after washing. It was the perfect space for a family whose livelihood was roller coasters"
The dramatic changes caused by World War II brought a bleak oddness to the usual jaunty atmosphere of Coney. For fear of being a target, the neighborhood had to dim all their lights and cover their windows. Even most of the amusement lights had to be replaced with dim purple bulbs. The boardwalk and the shore were encumbered with war-readiness machinery from gun emplacements to huge underwater submarine nets. The end of the war brought many highs and lows for the Bonsignore’s as well as other Coney amusement families. Though John and his father were dedicated to persevere in order to keep their family businesses thriving, they could not have imagined the looming turmoil that lay ahead. 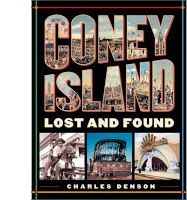 Charles Denson, at the same time, takes us up to the present and shows us that the issues facing Coney Island today are mere echoes of the past. One that enrages us and has us asking what can be done today to learn from it. “Wild Ride” is a time machine; a rousing journey in a sometimes dissonant reality. With eloquence and charm, Denson meticulously takes us through the nuts and bolts of John Bonsignore’s wild ride as we disembark onto that wonderful time and place and feel the hard work on our shoulders.....envision the talent in the craftsmanship.....and even smell the grease. "Wild Ride! A Coney Island Roller Coaster Family"
220 pages, 100 photographs and illustrations. The Cyclone Exhibit Space Grand Opening! The Rise Of Coney....A Vertical Theme Park? Coney Island History Project's Upcoming Events! Ratner & Gehry Eyeing Coney Again?